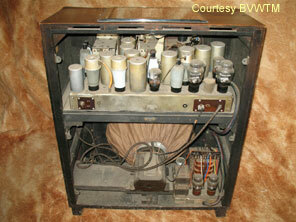 Shown above is the A40C, considered to be one of the best radios Murphy ever made, if not the best. It is large and heavy, with an enormous 15” loudspeaker. The receiver utilises 15 valves, including two rectifiers, magic eye and a push-pull output stage. This receiver is a double superhet, to improve reception on the SW band. 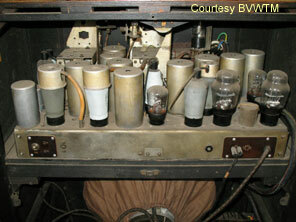 The receiver also includes ATC (Automatic Tuning Correction) first seen on the A28C in 1935. Two separate chassis are used in the construction of the receiver. 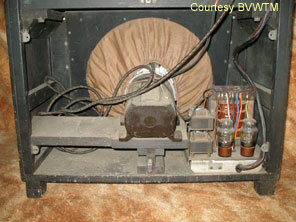 The power chassis (pictured below right) at the base of the cabinet carries the mains transformer, chokes and rectifiers. The upper chassis (pictured below left) carries the RF and output elements of the receiver. The push-pull AC4/PEN output valves can be seen to the far right of the chassis (mid-right above). These would be expected to deliver about 14w. Unlike most other manufacturers who were (eg Dynatron, RGD, HMV, Marconi etc) aiming for the upper end of the market, Murphy were never convinced of the need to incorporate triode valves. The loudspeaker (pictured below right) is positioned on an upward facing incline to direct sound towards the mid-height area of the listening room. Interestingly, Murphy have not included any sound baffle material to the internal panel areas of the cabinet as seen on the A28C from a year or two earlier. 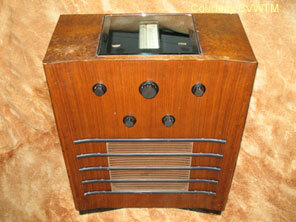 This console uses the drum system of alphabetical tuning, which becomes even more distinctive in this radio as the escutcheon is formed of a piece of smoked mirrored heavy glass. The mirrored glass escutcheon was to appear a year later on the quality table and console models A50 and A50C. As well as the non-mirrored section for the tuning drum, there is also a small window from where the magic eye is visible. Another window (to the right of the drum scale) provides a visual indication of the waveband selected (by means of mechanical linkages from the wavechange switch). Valve line up is AC/TP, AC/VP2, AC/SP1, AC/SP1, V914, AC/VP2, AC/TH1, AC/ME, AC4/PEN, AC4/PEN, UU4, UU4.